If you’re looking for fun and exciting outdoor activities while visiting Lincoln City. Check out our fat bike rentals and fat bike beach rides. Fat biking is quickly becoming a more and more popular Oregon coast activity with tourists and locals alike. 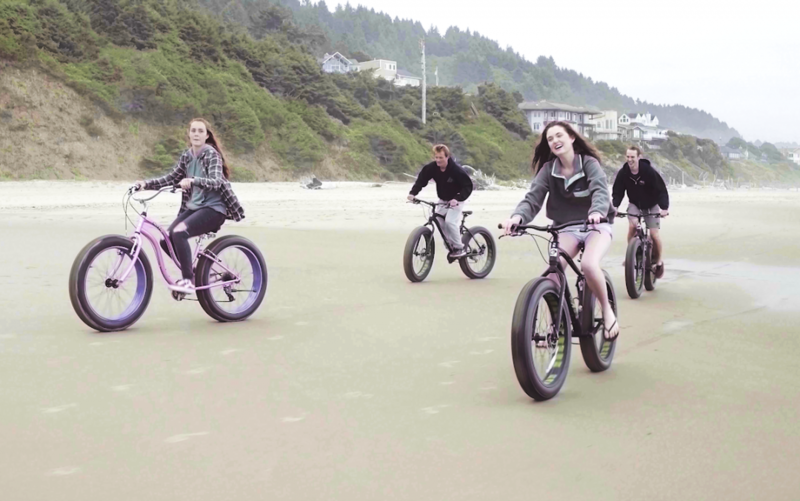 Fat bikes allow you to experience the Oregon coast up close and personal and in a whole new way! Fat bikes also allow you to experience a lot more of our beautiful coastline than you can by just walking. You can also quickly get away from the beach accesses and do a lot more exploring off the beaten path. With a 4 inch wide tire fat bikes cruise over sand and rough terrain with ease and a lot less effort than a traditional bike. Riding at lower tides on the hard pack is the best option for an easier ride. We also suggest going against the wind at the beginning of your ride so you will have the wind at your back on your return. It’s easy to go flying down the beach with the wind at your back at the beginning and then having to struggle against the wind on your return. Safari Town offers 2 fat bike beach rides accessible from the shop. Siletz Bay Ride… Details coming soon. Beach access just a short distance from Safari Town Surf Shop. There’s a lighted crosswalk just a few blocks north of the shop and visible from the front of the shop. No need to transport the bikes because you can park in the rear of our shop and be on the beach in 5-10 minutes. Try to plan your ride when the tide is lower. Look up the tides and don’t go around any headlands that may be impassable at higher tide. You want to ride safely and avoid getting trapped anywhere by the incoming tide. The hard packed sand is easier to pedal on than the soft sand and there is lots more hard pack at the lower tides. Ride against the wind at the beginning so you don’t end up 5 miles down the beach and have to go against the wind to get back. Mornings can often be less windy, but always check the forecast. Don’t ride on days when the surf is hazardous and big tidal surges are predicted. You can check the surf report on our website. Don’t ride in the salt water. It may be tempting, but it’s very hard on the bikes and gets sand into the drive train and cassette sprocket and that makes pedaling much more difficult. You want to keep the chain and components as free from sand as possible. Rinse your bike thoroughly with fresh water immediately after your beach ride. This will help get the corrosive elements off your bike. Be respectful of marine wildlife, and shore birds. Give them some space and stay clear of them. Watch out for pedestrians and share the beach with others. Bring your cell phone. They are great for taking photos, and if you get into any trouble you can call for help. Posted in Things to do in Lincoln City Oregon and tagged fat biking Lincoln City Oregon, Fat Biking the Oregon Coast.